ASI Waste provides a one stop shop for all of your construction project needs! From roll off dumpsters, to portable toilets, to storage units and even specialized concrete wash out containers! We are experts in the management of the various waste streams for our contractors. We provide sustainable solutions for the various waste streams generated, ensuring maximum efficiency and recycling. We provide locking storage units to house the tools and supplies you need daily on the job site. We also offer various sizes and styles of portable restrooms and water storage systems. Cleaning and pumping services can be completed weekly or more frequent if you choose. Finally, we offer any size dumpster you need to haul your job site debris away. Whether you need a standard roll off dumpster, walking floor trailers, or a specialized concrete wash out container – make ASI Waste your single point of contact for all of your construction project rental needs! Construction and demolition debris (C&D) from a job site has various items that can be recycled, when properly managed. It is very common for contractor’s C&D to be dumped into a landfill because it’s easier than trying to separate the recyclable materials out at the job site. This has prompted a new service within the waste and recycling industry. 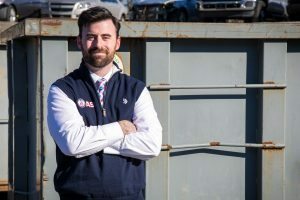 Landfill space is at a premium and truly limited, that is what created the opportunity for innovators in the industry to develop a less expensive option that keeps material out of the landfill. We work with state of the art regional facilities to capture the greatest amount of recyclable products from your construction waste. We provide a single container at your job site, you fill it up, and the recyclables are separated at the recycling center! This provides a great way to reduce your costs, easily capture more recyclables and minimize your landfill usage! We also provide recycling reports for our clients working towards a LEED Certification. Our reports are specific to each dumpster pulled from the jobsite and the recyclables that are captured from that dumpster. We clearly show the landfill avoidance and recycling on our reports making it very simple to track. We also offer specific tracking services for customers requiring it. Utilize ASI Waste as your one stop shop for all of your construction project needs! Construction and demolition (C&D) projects create an enormous amount of trash that typically is landfilled. But now it doesn’t have to. Many facilities are now sorting construction and demolition waste by waste type to create a recyclable commodity and minimize the volume going to C&D landfills. The materials removed from the waste stream vary by market and site, but typically include cardboard, metals, wood, and aggregate materials such as concrete and shingles. Some facilities also sort out the drywall and plastics for recycling. ASI Waste is a leader in providing LEED services. We understand the need to achieve high recycling rates with C&D roll offs. We work with several facilities specifically on LEED recycling services. The C&D is all put into one container and sorted at recycling centers. The recyclables are separated, tracked, and reclaimed. This process ensures that the majority of the materials put in the C&D containers are recycled. We have a great program which includes container specific tracking..
No matter what options you select, our portable restrooms will keep your job site running efficiently. 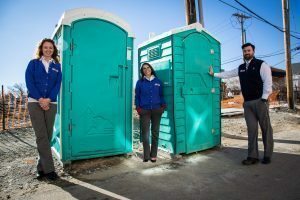 If you are unsure of what type of portable restroom is best for your job site, please give us a call for a recommendation based on the number of employees and duration of your construction project! We supply quality portable restrooms with a commitment to excellence! 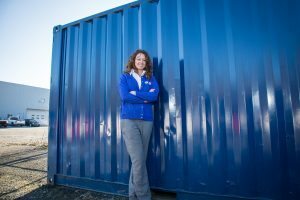 Our portable storage containers are designed to offer secure, safe and easy solutions for the construction industry, although they are also suitable for residential, commercial and industrial use. So whether you need to clear up space for a home renovation, extra storage of business equipment or need a secure environment on your job site for tools and materials, ASI Waste has an array of storage containers to fit your needs!